(CNN) -- It's been 145 years since Abraham Lincoln appeared on a ballot, but admiration for the man who saved the union and sparked the end of slavery is as strong as ever, according to a new survey. 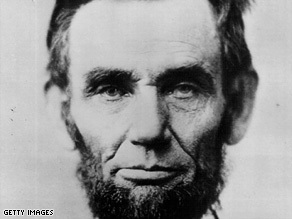 Abraham Lincoln, seen in an 1861 photo, tops the list of former presidents in a new survey of historians. Lincoln finished first in a ranking by historians of the 42 former White House occupants. The survey was released over Presidents Day weekend. The news wasn't quite as good for the latest addition to the nation's most exclusive fraternity: George W. Bush finished 36th in the survey, narrowly edging out the likes of historical also-rans Millard Fillmore, Warren Harding and Franklin Pierce. James Buchanan -- the man who watched helplessly as the nation lurched toward civil war in the 1850s -- finished last. "As much as is possible, we created a poll that was non-partisan, judicious and fair-minded," said Rice University professor Douglas Brinkley, who helped organize the survey of 65 historians for cable television network C-SPAN. The hero of Springfield, Illinois, finished first nine years ago as well. "It's fitting that for the 200th birthday of Abraham Lincoln that he remains at the top of these presidential rankings," Brinkley said. "Lincoln continues to rank at the top in all categories because he is perceived to embody the nation's avowed core values: integrity, moderation, persistence in the pursuit of honorable goals, respect for human rights, compassion," Howard University's Edna Medford added. Founding father George Washington finished second in the new survey, followed by Franklin D. Roosevelt, Theodore Roosevelt, and Harry Truman, in that order. Bill Clinton registered the greatest gain among recent presidents, jumping from 21st to 15th in the survey. Ronald Reagan edged forward from 11th to 10th overall, while George H.W. Bush moved up from 20th to 18th. The prize for the greatest jump in approval from historians over the last nine years, however, went to a president who has often sat near the bottom of such rankings: Ulysses S. Grant. The Civil War general jumped 10 notches, from 33rd to 23rd. Grant has traditionally received poor marks for corruption among people in his administration and the failed postwar reconstruction effort he presided over. But the nation's 18th president may be getting a bounce from all of the recent attention focused on Lincoln, Medford said. "Grant won the war for Lincoln," she noted during an appearance on C-SPAN's "Washington Journal." "A new look at the totality of his career may be improving his presidential stature," she said. "Bill Clinton and Ulysses S. Grant aren't often mentioned in the same sentence -- until now," historian Richard Norton Smith said. "Participants in the latest [survey] have boosted each man significantly higher than in the original survey conducted in 2000. All of which goes to show two things: the fluidity with which presidential reputations are judged, and the difficulty of assessing any president who has only just recently left office." In his final news conference before stepping down last month, George W. Bush made it clear he wasn't concerned with poor initial judgments of his presidency. "There is no such thing as short-term history," Bush said. "I don't think you can possibly get the full breadth of an administration until time has passed." The survey's participants ranked Bush 41st on international relations and 40th on economic management -- ahead of only Herbert Hoover.